It was immediately apparent that the Larsen 6.2s reproduced music with exceptional tonal accuracy and a high level of resolution. On the first score, singers always sounded like themselves and instrumental timbres were reproduced with all their complexity intact. After a few days of concentrated listening, I got around to the “Old Italian Violin Test” (see my review of the Magico S1 Mk II in Issue 270, or online, for details) in which one artist plays the first minute of the Sibelius D minor Concerto on 30 rare instruments, 15 made by Antonio Stradivari and one of his sons, and 15 by Giuseppe Guarneri del Gesù. With most good loudspeakers, even a listener with little experience in seventeenth-century Cremonese violins will come away from the exercise with the ability to distinguish a Strad from a del Gesù—the former’s brighter, more focused sonority vs. the latter’s darker, earthier tone. With the Larsen speakers, I was able to distinguish among instruments crafted by one of the two workshops. For example, the “Oliveira” Strad, created in 1692, was heard to possess a bigger and bolder sonority than the “Auer” Strad of 1690. It was possible to parse varied hues within one musical tone color. In terms of resolution, I should stress that we’re not talking about hearing the kind of hyper-realistic musical minutiae that some speakers uncover but, rather, the subtle textural detail that one perceives in a hall, even when sitting fairly far from the performers. Via the Larsens, the ensemble string sound of the Mandelring Quartet playing Shostakovich’s disconsolate and terrifying Quartet No. 8 in C minor was utterly convincing. And with “Southern Cross” from the 1982 CSN album Daylight Again, it was evident that David Crosby wasn’t participating in the richly harmonized chorus on that selection—the inner vocal parts were handled by Art Garfunkel and Timothy B. Schmit, audibly so with the 6.2s. Larsen’s promotional materials boast of “deep and precise bass all the way down to 26Hz,” a claim I took with a grain of salt. True, the low-frequency output from a single 7" woofer in a loudspeaker positioned against a room boundary should be greater than what would be expected from that same driver in an enclosure meant to be placed out in the room. However, with the Pass amps and Anti-Cable wires, acoustic bass lines with small jazz groups were muddy and uneven. Things did get better when the bi-wires were replaced by single-wire Transparent Ultra. But the improvement wasn’t nearly as consequential as that seen (or heard) with two other changes. I felt it was important to drive the 6.2s with an amplifier priced more in line with the Larsens, and so I connected them to a $995 Parasound Halo A23. While there was some loss of tonal refinement and detail with the switch, the bass definitely improved. The Parasound puts out 200Wpc into 8 ohms as opposed to 60Wpc for the Passes. Clearly, these little speakers thrive on power; in fact, I later learned that John Larsen’s reference amplifier is a Gamut Di150 LE, which is rated at 180Wpc into 8 ohms. I then did something I wasn’t originally planning on doing—powering the 6.2s with my 200Wpc David Berning Quadrature Z monoblocks, an undeniably unlikely pairing as these amps cost roughly eight times the price of the speakers. The sonic result was amazing, including the bottom end. Bass and kick-drum had satisfying punch, and the organ in the Philadelphia Orchestra’s recording of the Saint-Saëns Symphony No. 3 on an Ondine SACD was majestically massive. Like many well-designed loudspeakers, the Larsen 6.2s will perform well with modestly priced amplification of high quality but also have the potential to sound even better with über-electronics. The other opportunity to improve bass performance came when I ran a DSP room-correction calibration with the Anthem’s ARC software. Inspection of the frequency response curves revealed some irregularities from around 30 to 400Hz—a phenomenon I’ve noted with most loudspeakers I’ve measured in this fashion. Employing the calculated room correction helped to smooth out the bass response considerably, on paper and to my ears. The lesson is this: The up-against-the-wall placement of Larsen loudspeakers offers a definite advantage in terms of bass output compared to free-standing speakers in a typical domestic environment. But that doesn’t preclude room-related irregularities in bass response that may require attention with either physical acoustical treatments or electronic room correction. For its size, the Larsen 6.2 is a definite overachiever when it comes to bass output and dynamics that won’t leave most listeners uninvolved—whether with late-Romantic symphonic repertoire or energetic pop and rock. If you’re going for realistic dB levels with Boris Godunov or Daft Punk, you’re going to be disappointed. For many, though, the 6.2s will effectively transmit the power and excitement of large-scale music of all sorts because of all the things it does so well. What we have in the Larsen 6.2 and other Larsen models is the full realization of a decades-long effort to understand the behavior of real rooms and to leverage those observations in the design of a loudspeaker that will play music with a minimum of coloration and distortion. 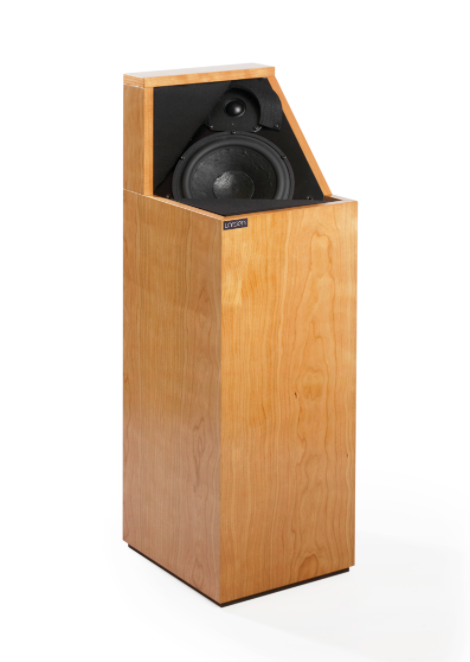 If your loudspeaker budget is anything up to $5k, the Larsen 6.2 deserves a very, very long listen. Dimensions: 9 1/4" x 10 1/2" x 30"